China’s waste collection and management system has recently captured public attention. Much of that attention has focused on negative incidents – such as dumping scandals in Shanghai and Wuxi – or uncertainty about the future of waste treatment, with expected landfill closures in Shanghai for 2017. But how much do you really know about waste beyond the headlines? 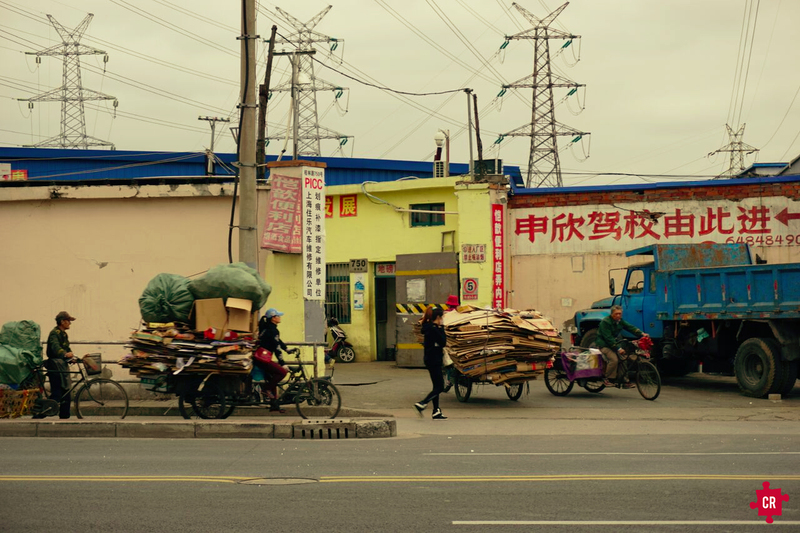 Collective’s work on waste in China has given us unique insights into the realities and trends of the formal and informal waste system. What we’ve found is a thriving economy with structured process, chains of command, and even material pricing standards that influence global markets. This article lays it all out for you. In China, 3.3 to 5.6 million people work in waste collection and management, and many media outlets view the sector as one of China’s largest underground economies. Collectors range from part-time workers who rummage through waste bins, to full-time managers who hire several hundred employees. Some apply for permits and manage large collection centers, while others simply invest in a tricycle and collect whatever they can find on the street. The sector is also highly specialized. Each recyclable material has its own subtypes, and many companies and individuals specialize in just one material. For instance, a collector can spend his entire career managing cardboard. He can work for a large collection center, operate his own company, and understand every cardboard type. When dealing with other collectors, he’ll know the average weight of a single cart, which centers pay for plain or colored material, and what the international commodity price is on a given day. These workers form the core of China’s waste trade, and they all coalesce around large collection sites. Large sites employ collectors who sell their daily hoard on tricycles, managers and sorters who store material before treatment, and even transportation companies that ship sorted waste to nearby factories. Despite their large size, however, many collection centers go unnoticed. Very little research explores how they run, how many people they employ, and how they turn a profit. Shanghai – home to several waste centers – can provide a small window into understanding the industry. For the past few months, Collective Responsibility has explored multiple waste collection centers across the city, interviewing workers in the process. Each collection center has a similar layout, and like any major company, consists of employees with specialized roles. 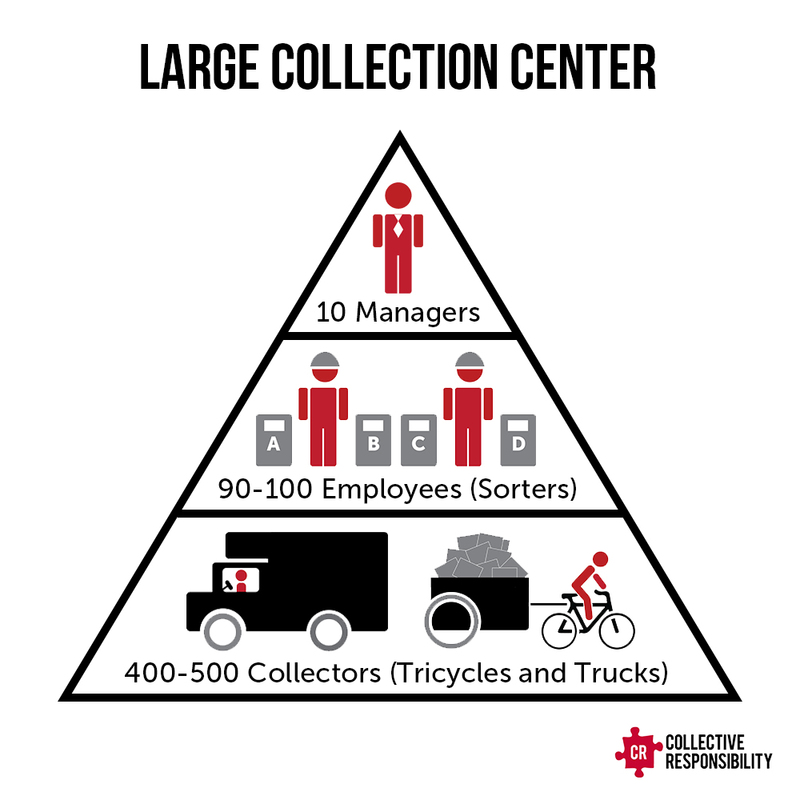 How do large waste collection centers work? Shanghai has over nine large-scale collection centers. Each manages nearly 600 people, including 10 managers, 90 employees, and between 400 and 500 citywide collectors. Each manager is responsible for one material – cardboard, scrap metal, glass, and sometimes wood – and delegates work to his own team. The 90 employees then weigh incoming material, bargain with collectors on tricycles, and sort material depending on quality and subtype. An average day at one of these centers can appear chaotic. Like a busy marketplace, each site supports a constant flow of tricycles, large trucks, and potential inspectors from municipal fire and police departments. In front of one site, the Collective research team saw 33 tricycles enter and exit in only fifteen minutes. The tricycles included 20 with paper, two with aluminum frames, seven with plastic bottles, three with scrap metal, and one with furniture (mostly wood). This scale of input is not unusual – and actually underestimates average traffic to these centers on any given day. In addition to managing tricycles, site workers also deal with large trucks and outgoing waste. They establish partnerships with private transport companies and sell a steady stream of material, which is then shipped to factories, recycling centers, and manufacturers. How much money do large sites make? Given the heavy workload, site traffic, and long hours, some might wonder whether this career is worth it. How much do collectors earn, and does it compensate for manual labor, 15- to 16-hour days, and few trips home? According to some workers, the pay is substantial. 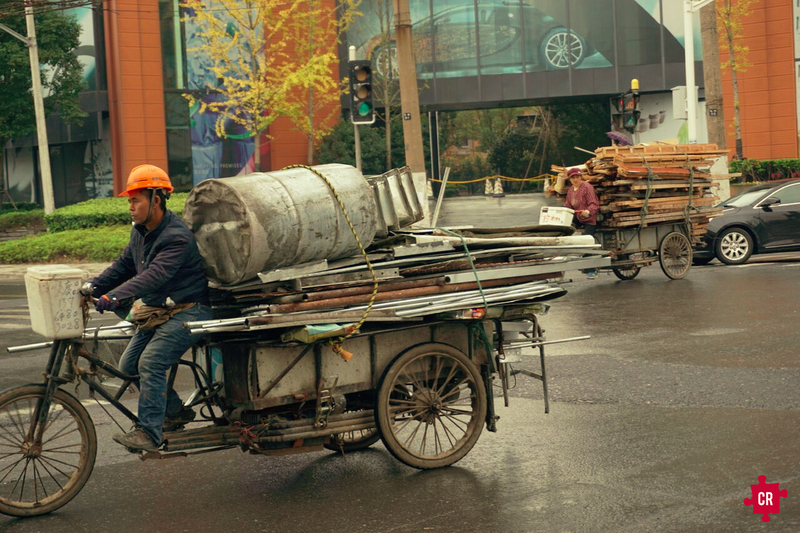 Private collectors on tricycles earn roughly 100 RMB per shipment of cardboard and transport two full loads per day. This means that the average collector who works at the bottom of the waste food chain makes 200 RMB per day – nearly 67,200 RMB per year. In comparison to average income levels in Shanghai, this value is not too shabby. A collector’s annual salary falls well above minimum wage, which guarantees 26,280 RMB per year, and is roughly equal to the city’s average annual income at 70,692 RMB per year. In reality, many collectors’ annual salaries are even higher and rank well above the city average. Cardboard and paper are among the cheapest materials available, whereas a cartload of metal scraps or copper wiring could fetch a much higher price. Based on our research, a large collection center will pay six to seven RMB per kilogram of aluminum, and will pay as much as 35 RMB per kilogram of copper. This could indicate that negative stereotypes about the value of waste and waste collection are a bit off. 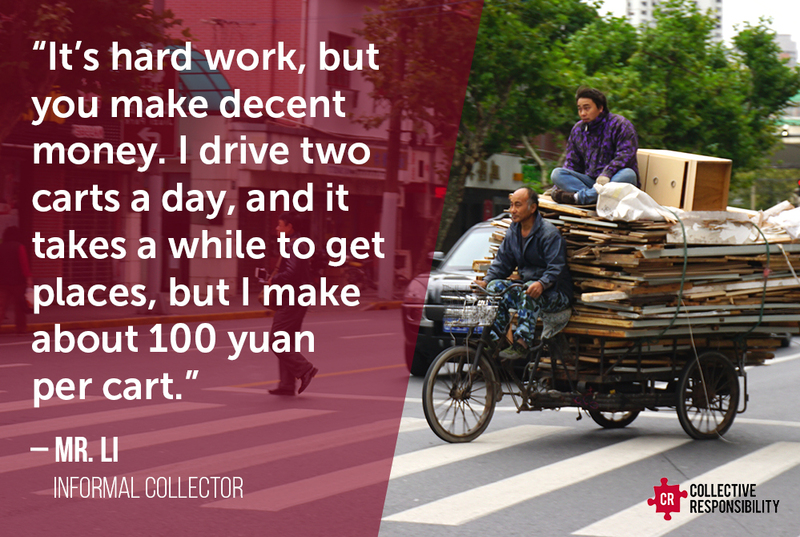 Far from underpaid, these jobs are potentially some of Shanghai’s most lucrative, requiring little more than a tricycle and an able body. Employment and earning potential form only a small piece of Collective Responsibility’s waste research and findings. For more information about waste management, future challenges, business opportunities, and Shanghai’s waste entrepreneurs, check out our articles under the Waste tag. Follow Collective on social media to receive updates on upcoming articles, reports, videos, and events. Tags: circular economy, informal recycling, urbanization, waste.